Schizandra is a plant that is native to northern China and eastern and northern Russia. Its name translated from Chinese means the five flavor berry. The berries of schizandra earned this name because they are said to have the five flavors of salty, sour, sweet, bitter, and pungent or spicy. The plant is a vine that typically climbs around tree trunks and it produces small red berries, which are the edible and medicinal portion. 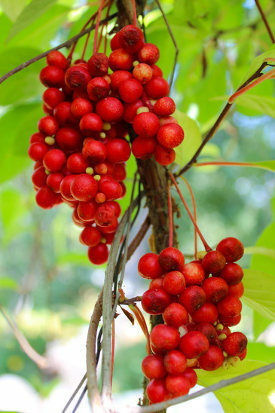 The people of China, Russia, Korea and Japan have long used schizandra for its medicinal benefits. In these countries the berries are used to make wine, tea, juice, sweets, and extracts. Traditionally these extracts and products containing schizandra have been used to treat a variety of conditions. They include respiratory illnesses, diarrhea, asthma, impotence, insomnia, and liver and kidney problems. It has also been used by athletes to improve endurance and to counteract fatigue. In traditional Chinese medicine schizandra is one of the 50 fundamental herbs. It is considered particularly special among these medicinal herbs because of the five flavors which correspond to the five elements of water, wood, fire, earth, and metal. Schizandra is also believed to be aligned with all 12 meridians and to be able to access the three treasures of qi, jing and shen. What are the Benefits of Schizandra? Today, modern medicine and scientific research are struggling to catch up to what the Chinese, eastern Russians and Koreans have known for over a thousand years: that schizandra provides a number of health benefits to those who consume its berries regularly. You can take advantage of the miraculous effects of schizandra as it becomes more accessible in the west. Liver protection. Animal studies have shown that schizandra helps to protect the liver from the damage caused by toxins in the diet and from the environment. It also improves the overall functioning of the liver and stimulates the growth of new liver cells. Limited research has shown that it can also help people recover from hepatitis B, a disease involving the liver. Protection from cancer. There is also some limited evidence from research that schizandra may contain antioxidants that can protect against cancer or even kill cancer cells. Research into the anti-cancer properties of schizandra has so far been limited to a few studies, but the results are promising. In one study, a substance found in schizandra, called schisandran C, was found to stop the growth of cancer cells in a laboratory. Endurance and stamina. Athletes and hunters in China have longed used schizandra to combat fatigue and to improve endurance and performance. Some modern athletes claim that consuming schizandra every day improves their physical performance and also makes them more mentally alert and better able to think and concentrate. There is some research to back up the claims, but it is limited. Respiratory health. People have long used schizandra to get relief from respiratory illnesses. It seems to be able to reduce coughing. It can also help someone with asthma to breathe more easily. This may be related to the purported anti-inflammatory effects of the berries. Combat stress. Schizandra can help you reduce your stress levels, as it acts as an adaptogen. An adaptogen is an herb that promotes homeostasis. Greater homeostasis decreases your body’s sensitivity to stress. With daily schizandra you can better cope with life’s stresses. Immune system boost. Schizandra is thought to boost the functioning of the immune system. It may promote the function directly, but also supports the immune system by lowering stress. Stress can cause the immune system to become weakened. Sleep Better. People have long taken schizandra extract and have consumed schizandra tea to combat insomnia. Part of the reason it works to promote better sleep is the impact on stress. Longevity and vitality. Schizandra has long been recognized as an herb and supplement that promotes longevity and acts against aging. We know today that the berries are rich in antioxidants, but they also have an anti-inflammatory effect in the body. Both of these actions help to improve cellular function and promote a longer life. In traditional Chinese medicine the ability of schizandra to promote longevity and vitality is attributed to its relationship with the three primary life energies of qi, jeng, and shen. Skin health. Schizandra may be able to improve the condition of your skin. It has traditionally been used to treat skin conditions and also seems to promote a healthy, glowing and youthful appearance when used regularly. Mental stimulation. Schizandra has been shown to promote brain health and activity. It can help you feel invigorated and energetic, while also improving focus, concentration, and memory. Cardiovascular health. In Korea, schizandra is used in traditional medicine to improve cardiovascular function. It is thought to improve blood flow by promoting the health of blood vessels. Sexual health. Most likely because it improves blood flow, schizandra can also improve sexual health and has long been used to treat impotence. Schizandra is considered to be generally safe to take for most people. Research into the effects of schizandra on the body is limited in modern science, but it has been used for thousands of years by the people of eastern Asia. There are a few potential side effects including a skin rash, upset stomach, and heart burn, but most people never experience these. There is a slim chance that schizandra can promote contraction of the uterus, which could potentially lead to a miscarriage. Pregnant women should not use schizandra for this reason. It is always a good idea to tell your doctor about any herbal supplements you take in case there are any interactions with medications that you have been prescribed. Schizandra is most often used in its powdered form. You are not likely to find the fresh berries for sale. The powdered berry extract is made from ripe schizandra berries. The process locks in the nutritional benefits so that you get a powder that gives you concentrated schizandra. The amount you should use each day depends on the brand and how concentrated the powder is. A general guideline is to use between one quarter and one teaspoon daily. Start out small and work your way up to larger quantities to allow your digestive tract to get used to this new supplement. You can use your schizandra powder in just about any smoothie recipe as a supplement for nutrition. If you find you don’t like the taste of the powdered berry, you should be able to find it in capsule form, or you can bury it in a smoothie with flavorful ingredients like cacao or coconut oil. If you want to embrace and enjoy the flavor of schizandra powder try combining it with ingredients that go well with other berries. Add a teaspoon to your favorite mixed berry smoothie recipe, for instance, or combine it with acai pulp, pomegranate juice, or goji berries. Schizandra also pairs well with citrus flavors like orange, lemon, and grapefruit. Here is a simple recipe to get you started. Toss all of these ingredients into your blender and blend for about 30-45 seconds or until your desired consistency is achieved. Another great way to consume schizandra is through this refreshing drink, which I like to have first thing in the morning when the weather is warm. Combine the ingredients in a quart mason jar or similar container and shake vigorously. However you decide to consume schizandra, make sure that you use this supplement every day. By using it regularly you will see the maximum benefits to your longevity, liver health, skin condition, immune system functioning, and to your overall health in general. You can check your local health food store. I highly recommend Surthrival’s organic, concentrated schizandra berry powder. It’s absolutely awesome. The schizandra berries are 100% American grown in pristine, mineral rich soil on a 50 acre farm in Massachusetts. The nutrient dense berries are processed immediately on site to preserve their integrity. For more information or to purchase Surthrival’s schizandra berry extract, click here.